The last you heard about my progress studying book two of the Heisig method [of learning to read & write Chinese] was in January, where I admitted that I had started studying the book again, after failing to get off the ground a few months before that. Back in July 2012 I kinda started the book for the first time, but because I didn't get into a regular habit, the days between picking up the book kept increasing, and after a while I just shelved it. Literally. So why was this year's attempt more successful? Mainly because I went with the flow more, put less pressure on myself, and took time to enjoy it more. And three months later, I'm still progressing nicely, according to plan. I had to accept that although I did Book 1 in three months - that was right for that book at that time. This book is different, and this time is different. So this year's goal suits this year's circumstances. Thus I have set myself the goal of completing the book by the end of 2013, which amounts to just over 4 characters a day. That doesn't seem like much, but given that I'm also doing podcasts and other full-sentence flashcards, this is on top of that. It's enough. I completed the first 500 characters of Book 2 (making it a total count of 2000) on 9 April, which is about 5 characters a day - not bad. I don't do it every day, I'm still not fully into the habit, but it's regular enough. 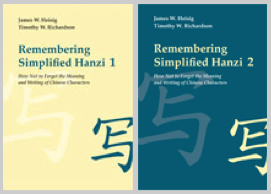 I use TWO METHODS to revise: (a) I keep going back in the book, sometimes the most recent chapter, sometimes even earlier chapters; (b) I also started using an Anki flashcard pack (downloaded off the site's free collection of packs) - which tests Chinese-to-English. I began that in late Feb, setting it to introduce five 'new' characters a day, so that it will also reach the end of the set by the end of the year. Of course, I will always be slightly further ahead with the book than with the flashcards, so actually it is a pure revision mechanism. Although I complained in January that the characters in this book were much more complicated, actually it's not that bad. Of course, on average, they are more complex than Book 1, but they're really not that bad. So far. So that's where I am. Is anyone else reading this post also doing Book 2? Or anyone who has already finished Book 2 that has comments or suggestions? Would love to hear from you.